Jordan Spieth, Rory McIlroy and Phil Mickelson remain unbeaten after day two of the WGC-Dell Match Play in Texas. 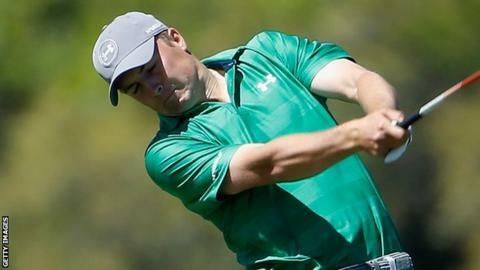 American world number one Spieth, who defends his Masters title in two weeks, beat Frenchman Victor Dubuisson 5&4. Northern Ireland's McIlroy beat Smylie Kaufman, of the United States, 3&1. Mickelson won 1 up dramatically against US compatriot Daniel Berger, who pulled out with an injured wrist after striking a rock while trying to play his second shot at the 18th. Australian Jason Day showed no sign of the back injury which troubled him in his opening match against Graeme McDowell on Wednesday with a 5&3 win over Thailand's Thongchai Jaidee. Also recording a second wins in the competition was England's Andy Sullivan, who defeated Matt Jones of Australia 3&1. McDowell and Paul Casey can now not progress to the last-16 knockout stage after they halved their match on Thursday. Every player in the 64-strong field contests three matches in his group in a round-robin format, with 16 players advancing to the knockout phase which starts on Saturday.